In addition to convenience, cloud computing is touted for its money saving capabilities as companies reduce software licensing costs and hardware requirements. These issues exist more in the public cloud than the private cloud, Busseri explains. “The public cloud is great in terms of functionality but from a privacy standpoint you don’t know where the information is going,” he says. And once the data is in the cloud it’s not necessarily possible to get back. “It’s like trying to put toothpaste back in the tube,” Busseri explains. The problem begins when an organization decides to start using a cloud-based application, says Andy Land, vice president of marketing at UnBoundID Corp. The use of a cloud app typically doesn’t begin with IT but out of a business need. He cites the example of a sales director who finds an app to enable his staff to more easily track of sales leads in the cloud. He has a few of his staff start to use it and they find it is easier than the prior system. The director migrates the entire sales staff to the cloud-based solution, and only after some issue arises does he go to IT and ask them to fix it or manage the system. This doesn’t make IT happy, he notes. 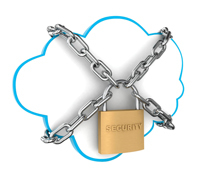 Auditing and provisioning are two specific weaknesses with cloud-based identity management. With no central ID repository each application is managed separately and there is no central audit trail to check an employee’s activity, explains Platt. This also leads to issues when an individual leaves a company and has to be de-provisioned. Cloud-based single sign-on can be created, says Platt. There are a number of different approaches. One would have vendors deploy an in-house gateway that strings together the different cloud-based sites, apps and authentications. The combination of mobile devices and cloud computing can enable individuals to access information anywhere they have an Internet connection. The cloud and mobile computing may revolutionize the physical access control industry, says Tam Hulusi, senior vice president for Strategic Innovation and Intellectual Property at HID Global. With cloud-based physical access control the phone will be the rules engine. When an employee goes to a door several thing will happen. The phone will confirm the location, make sure they have proper authorization to access the area and ensure that they are allowed access at that specific time. All this data will be checked against data stored in the cloud and then the handset will send an encrypted signal to the door for it to open. “Physical access control systems won’t have to be wired,” Hulusi says.